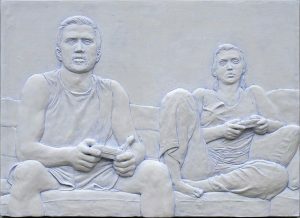 The National Sculpture Society will present the 2018 Dexter Jones Award to Evan Morse for his work Matt and Gabriela Play Battleborn. The $5000 award is presented annually to a sculptor for an outstanding work of sculpture in bas-relief. It is expressly for sculptors between the ages of 18-39 and is funded by an endowment in memory of Dexter Jones, past Fellow of National Sculpture Society. Morse received a B.A. from Wheaton College (MA) in 2009 and a M.F.A. from Boston University (MA) in 2015. His education also took him abroad, studying in Italy at Studio Arts College International (Florence) and Accademia De Belle Art (Carrara) and in China at SIAS University (Xinzheng). In 2017, the Massachusetts Cultural Council awarded Morse an Artist Fellowship in the Sculpture/Installation/New Genres category. Morse exhibits regularly in his home state of Massachusetts, as well as in Vermont and New Hampshire. The National Sculpture Society will present the award on Saturday, June 23, 2018 at the Honors and Awards Dinner, part of the Sculpture Celebration Conference which will be held June 22-24, 2018 in South Carolina.